adult series, the Living Blond trilogy, which is available to buy now at Amazon. You can find its blurb at the bottom of the interview, along with a giveaway to win 1 of 20 'We Love Marilyn Monroe/Marilynette' wristbands. The Living Blond trilogy centres around Nessa, a teen who is obsessed with Marilyn Monroe. What inspired you to write the series based around one of film’s most iconic leading ladies? Nessa had a bit of a funny start in life as a character. I was house-sitting for a friend, who told me to peep inside her housemate's room one day (she was also away at the time). When I did this, I couldn't believe my eyes. All over the room were huge glamour portraits of the housemate dressed up as Marilyn Monroe. Apparently she had quite the Marilyn obsession, as the portraits demonstrated. I wondered about this for years afterwards – I couldn't stop thinking about how a young person could be so obsessed with Marilyn Monroe, a star long dead. This is how Nessa evolved – I took that character trait to an even younger, stranger place. Imagine a thirteen-year-old with a Marilyn obsession – how strange would that be? What would people make of it? What would her parents do about it if it got out of control? And that was how Nessa came to be. It was interesting to stay with her over three books and watch her grow and her obsession slowly fade, with her eventually handing the torch over to a new Marilyn fan by the end of the third book. Tell us about trilogy’s leading lady, Nessa. What do you hope readers will enjoy about her personality? I really hope readers will love her overactive imagination and crazy ability to see what might not be there (okay, is definitely not there, but is way more entertaining). Like your previous release, Shooting Stars, The Living Blond trilogy has been written for the young adult audience. What do you find most appealing about writing for this demographic? Do you see yourself writing for an older audience in future? I actually started out writing for adults (my first chick-lit novel came out in 2000) and moved towards writing for young adults after that as I found I simply enjoyed it so much. It's just such a great time of life – very heady and self-involved (in a good way!) when anything and everything is possible. I really love the immediacy of YA and the fact that characters tend to act on their true emotions. Now to get personal: what’s your favourite Marilyn Monroe movie? Lastly, what other projects do you currently have in the works and where can we keep up to date? 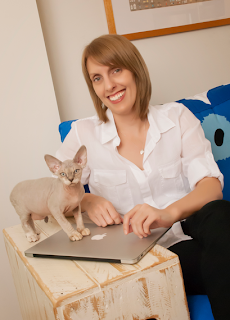 In 2014, I'll be releasing two other YA books – Blondtourage and Being Hartley. Readers can always keep up-to-date at http://www.allisonrushby.com, on Twitter, or on Goodreads. Nessa Joanne Mulholland, aka Marilyn Monroe's No. 1 teenage fan, is used to moving house. This time, however, she's relocating in movie-star style—crossing the Atlantic on board the Majestic, headed for Paris from New York City. And it really would be in movie-star style if it wasn't for the fact that she's bringing her cringe-fest professor dad along for the ride (Dad's specialization: human mating rituals—need Nessa say more?). Oh yeah, and sharing a cabin that's five decks below sea level and next to the engine room. Still, at least Holly Isles is on board. Yes, really, that Holly Isles—star of stage and screen. Suddenly, things are looking up. Looking a little Marilyn, in fact, because events are strangely mirroring Nessa's favorite movie of all time, Gentlemen Prefer Blondes. 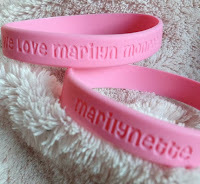 Complete the Rafflecopter form to win one of these very cute 'We Love Marilyn Monroe/Marilynette' wristbands!